He’s the kindest, most sincere person I’ve ever met. And passionate. About life, and his work, and art. And me. And I’ve just been basking in that light and figuring out how to share more of myself in turn. We’ve been in the city a few times. Visited museums, seen shows (Dear Even Hansen had me in a puddle on the floor) and been to some lovely restaurants. And we’ve carried one another back to Hoboken after soppy night in loud bars, meeting some of Cole’s friends. He’s a bit like me, a few close mates, but not what you’d call an absolute load of friends. Quality over quantity. We even went to The Cloisters. I’m not sure why but I wanted to go. I wanted to be face to face with the unicorn tapestries. They’re stunning, and all the more haunting once you know their secret history, once you know about Anne of Brittany and her court of artists and the secret paths of wool and silver. How her body was protected in death by materials from a secret tapestry. After the museum we went back to Cole’s. I needed a nap and Cole had some reading to do. I fell asleep in a snap and dreamed I was watching myself being pulled apart like Anne. My body, my bones, my entrails, my heart. I woke up in a cold sweat. And then something occurred to me. I felt like I’d been bowled over by a tidal wave. I rushed out, to the train. I only vaguely sensed Cole behind me, running to catch up. I had to get back to the city. I had to get back to the brownstone. Out of everything that happened over these past months, everything I experienced, the thing that stuck with me was what Colby told me in Montreal. Not the memory… It was what he said after. How he could sense that my heart was already guarded. I felt so stupid, taking offence at that. Obsessing over it. Stupid and young and naive. How dare he tell me I couldn’t open up, or love, or care. I wasn’t guarded. I wasn’t walled up. It felt like he’d looked into me and saw an insecure teenaged girl and I was embarrassed and angry and frankly, defiant. Not to say that these past weeks with Cole were retaliatory. If anything, they were me allowing *myself* to be proven wrong. I’d left Cole’s in such a frantic rush I’d forgotten to bring the keys to the brownstone and we had to climb in through an unlocked window off the fire escape. I rummaged through the clothes I’d left behind and finally found what I’d come back for. Colby was right. My heart had been guarded. Just like Anne of Brittany’s. The dream had reminded me how Anne’s heart had been buried, on a bed of wool, beneath a veil of silver, but also what Monica had sent along with my dad’s journal last year. 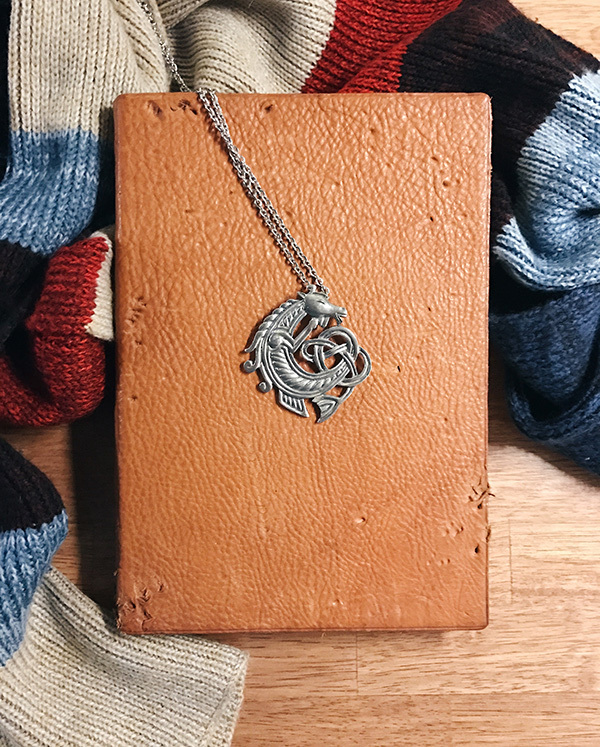 My father had left behind, in the attic of the house I grew up in, the journal yes, but also a wool scarf and a silver hippocampus pendant. Remember this photo? Was I reaching? Searching for meaning in nothing? Or had my father left me the last two tapestry artefacts from Anne’s story? Hidden in plain sight now as two objects you’d find boxed away in any attic. Two objects that would mean nothing to anyone, except for the sentimental value they held for me. The last remnants of my mum and dad. Was Colby supposed to tell me that about my heart? Was that another part of the path? Are these what my mum and dad found at the ends of roads? And if so, what the hell was I supposed to do with a scarf and a necklace? I had a long, hard moment of doubt. My cheeks were hot and red, embarrassed that Cole had rushed after me, back to the city, all because of some wildly farfetched idea. After everything I’d been through, everywhere I’d gone, as resoundingly as I’d said I’d given up, I needed there to be something more than the memory of my parents crumbling into the past. There had to be more. Was there? Or was I wishing the path to continue? But if it was all in my head, why had someone suddenly started knocking on every door in the brownstone? Dierdre, I don’t want to alarm you, but something has happened, is happening, and I want you and Cole to be prepared. The Storm is here, and it’s coming for The Book of Briars and the Mountaineers. Protect yourselves as best you can. And for the record… Im glad you aren’t done with us.